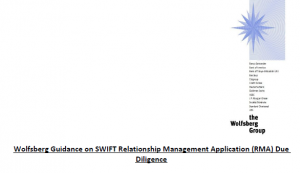 Lyddon Consulting has today issued a call to the Wolfsberg Group of leading international correspondent banks that it withdraw its 2016 guidance “Wolfsberg Guidance on SWIFT Relationship Management Application (RMA) Due Diligence”. You can download the Wolfsberg guidance here. You can download Lyddon Consulting’s full paper here. “But it has brought into question the other application of RMA – what is termed a “non-customer” RMA. The outcome of the Wolfsberg guidance on “non-customer” RMA has arguably been more detrimental to the marketplace than the materialisation of the risks the guidance was meant to eliminate”. SWIFT members – lacking RMA with which to exchange “value messages” directly – access one another over SWIFT through the intermediation of their correspondent banks, adding inefficiency, time and cost, and possibly precluding the transaction taking place at all or driving it off SWIFT and into non-transparent networks. All Wolfsberg Group’s 13 members figure in the Financial Stability Boards list of the world’s 30 Global Systemically Important Banks. Wolfsberg’s focus is on the business of correspondent banking. Indeed, all its members except Goldman Sachs are leading correspondent banks. “Wolfsberg guidance has a meaningful impact on market practice, and on the access of other banks and their clients to international banking services”, says Lyddon. The SWIFT RMA may seem like an obscure topic, but it is the mechanism that controls the ability of one SWIFT member to send messages across the SWIFT network to other SWIFT members. The Wolfsberg guidance raises particular concern where SWIFT members send messages to other SWIFT members when they are not correspondent banks of one another: this is called a “non-customer” RMA. Wolfsberg comments that such arrangements give rise predominantly to an operational risk but that “poorly controlled “non-customer” RMAs may (author’s underlining) give rise to a risk of Money Laundering in institutions with inadequate AML systems and controls”. This Delphic statement, not justified in detail in the guidance, has been enough to cause banks to eliminate “non-customer” RMAs wholesale. Wolfsberg’s own definition of a “non-customer” RMA is at best vague, but it is in the five use cases that the basis of Wolfsberg’s guidance is undermined. The first one – exchange of information messages in the MT9nn series – does not require RMA at all. The second one, applying to the exchange of the MT101 message, describes only one very basic variant of the multibank cash management service which MT101 supports. To offer an enhanced version of the service, banks do hold accounts with one another, and then their RMA is a “customer” RMA. The third use case describes a situation between a global custodian and their sub-custodian: when was such an arrangement put in place without cash accounts? These parties will have “customer” RMAs in place. The fourth one, on the usage of the MT7nn message series for Trade Finance, is actually two situations, one of which does involve “non-customer” RMA and one of which does not. The fifth use case – to do with exchanges with Financial Market Infrastructures – is like the third one: contrary to Wolfsberg’s assertion, cash accounts are involved so the parties will have a “customer” RMA in place. Three of Wolfsberg’s five use cases fall away because they are not exemplars of “non-customer” RMA. Then there is the missing use case and the most important: MT103 sent by the Cover method. “Wolfsberg’s guidance has led directly to the collapse of the Cover method of making international payments”, states Lyddon. “Now they are predominantly made via the Serial method, with a longer payment chain, more parties requiring fees, and less certainty as to what information on the payment reaches the beneficiary. End-to-end timing, value-dating, and all-in fees cannot be better for the end user under the Serial method”. Trade finance: enabling exporters and importers to enjoy risk mitigation (Country and Bank Risk) on cross-border trade transactions because more banks can be involved than just the main bank of the importer and that bank’s cash correspondent in the country of the exporter. “The Wolfsberg guidance on RMA has had a major and detrimental impact on the market supply of international banking services”, says Lyddon. “Authorities see the shrinkage of supply, are very concerned about it and attribute it to general de-risking. Authorities have been far less adept at identifying its underlying causes. Wolfsberg’s RMA guidance is one of them, and it should be withdrawn. Wolfsberg’s remit – self-awarded as it is a private organisation – is to combat Money Laundering and to counter the Financing of Terrorism. They have made no case that banks’ methods of managing RMA meaningfully increase or reduce AML/CFT risks. Indeed they state themselves that the risks are primarily operational. The response to their guidance, however, has been detrimental and, in our view, wholly disproportionate to the cases of AML/CFT risk that may have been mitigated by it”.